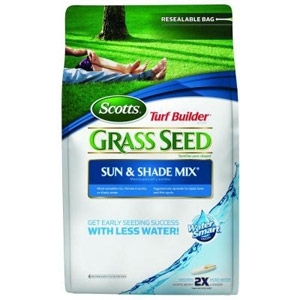 Scotts Turf Builder Sun and Shade Mix grasss seed is formulated to stay green in heavily shaded areas or areas that are in the hot sun. This formula contains Thermal Blue Kentucky Bluegrass, which is known for thriving in the hot sun and excessive heat. 7lbs. 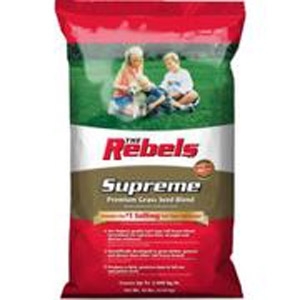 A high quality turf-type Tall Fescue blend formulated for supreme heat, drought and disease resistance. Formulated for supreme heat, drought, and disease resistance. Scientifically developed to grow darker, greener, and denser. Produces a thicker, premium lawn in full sun and partial shade. 99 percent weed free. 20 lbs. Covers 2800 square feet. Get early seeding success with less water. Absorbs 2 times more water than uncoated seed. Aggressively spreads to repair thin and bare spots. 7 lbs. Kentucky Bluegrass, perennial ryegrass & tall Fescue blend. Revolutionary seeding mix that grows anywhere! Contains everything you need for seeding success; special blend of grass seed, premium fertilizer & patented super absorbent planting mix. 50% thicker grass with half the water. Absorbs & releases water like a sponge to keep the seed moist. 3.75 lbs. 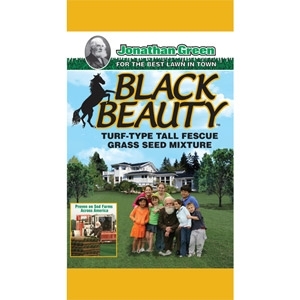 Black Beauty™ truly innovative darker-green turfgrass planted by Sod Growers. Grass leaves possess an invisble waxy coating, very similar to what you'd find on an apple. Preserves moisture in the leaf and wards off stress from heat, cold, wind and disease. Roots 4-feet deep into the soil. Redefines what a "green-lawn" is supposed to look like! Thrives in sun or shade. 15 lbs. Covers 4,500 sq. 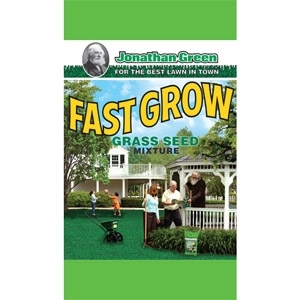 ft.
Fast Grow Mixture provides a hardy turf quickly in sun and shade. 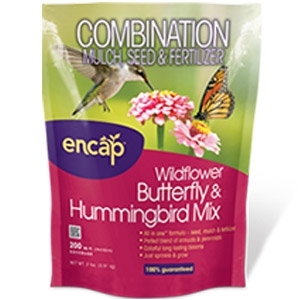 This is the perfect seed mixture where the fastest results are required. Germinates in just 7-14 days! 3 lbs. Covers 1,500 sq. ft.
All-in-one formula - mulch, seed & fertilizer. Perfect blend of annuals & perennials. Colorful, long lasting blooms. Advanced Soil Technology™ improves seed establishment & germination. Just sprinkle & grow. Coverage: 200 sq. ft. 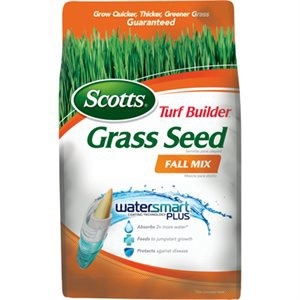 Turf Builder, 15 LB, Fall Mix Grass Seed, Coverage: 6,000 sq ft. Growns quickly in the fall in sunny or shady areas. Repairs lawns ravaged by summer heat, drought and pests. 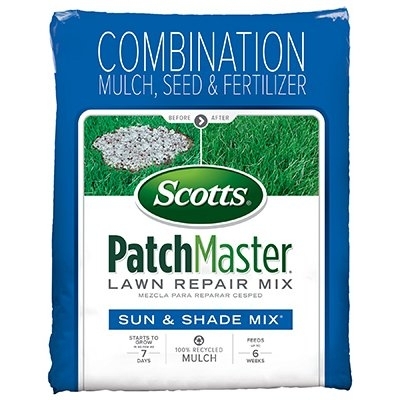 Scotts PatchMaster contains a combination of mulch, seed and fertilizer. It is designed to help you fix the #1 lawn problem - BARE SPOTS. Just add water and enjoy thick, new grass. It is pre-mixed and ready to grow. 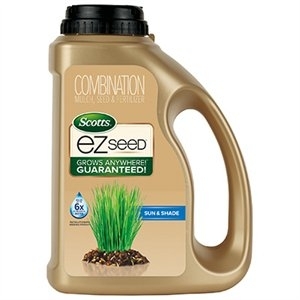 Scotts® Turf Builder EZ Seed Coverage 85 SQFT Grows anywhere! * Guaranteed! Improved seeding performance. 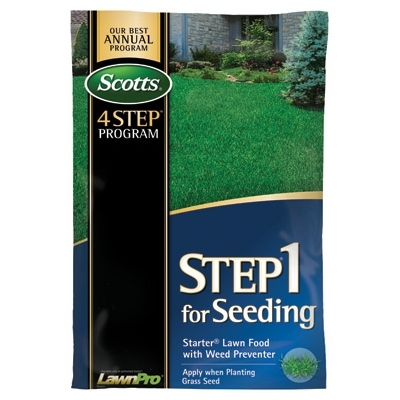 Helps protect seedlings against disease Just add sunshine and water, and let Scotts® do the rest! 50% thicker with half the water For dry sunny areas, dense shade areas,poor soil areas, even spreads to repair wear and tear. 3.75 lbs. Now you can seed and prevent crabgrass. 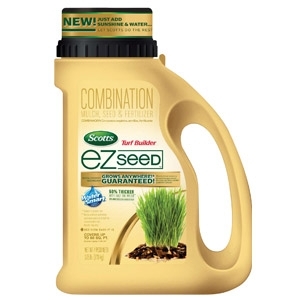 Apply when seeding to prevent crabgrass, foxtail, and other annual weeds. 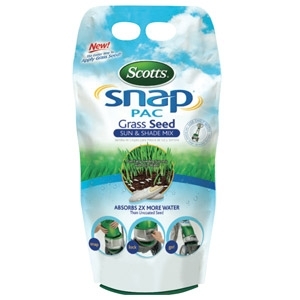 Feeds with scotts specially formulated starter brand fertilizer to help new grass grow. 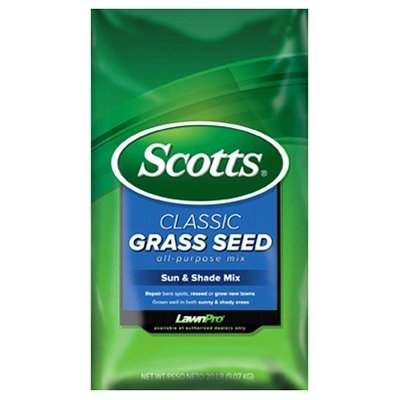 Scotts® Classic® Sun & Shade Grass Seed is great for repairing bare spots, reseeding or new lawns. Grows well in both sunny and shady areas. Builds a lush dense durable lawn. 99.9% Weed Free.